The Coquille Indian Tribe established its Community Fund in order to share the proceeds of The Mill Casino • Hotel with organizations that benefit the residents of southwestern Oregon. The fund seeks to strengthen the community by improving opportunities and lives throughout the region. 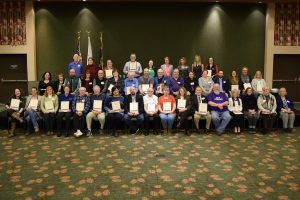 Representatives from 49 community organizations based in Coos, Curry, Douglas, Lane and Jackson Counties gathered at the Mill Casino-Hotel for the 2018-2019 Community Fund awards luncheon. Want to Apply or Login? Click here to start your online profile and apply for a grant. Click here to log in to an existing organizational profile. *If you are unsure if your organization has an existing profile, please contact the fund at jackiechambers@coquilletribe.org or 541-756-0904 x 1201. We think all our grantees are pretty special. Here’s a sampling that illustrates how Community Fund dollars work to improve our community. The Community Fund targets projects that will make a clear difference for daily life in the Coos Bay area and throughout southwestern Oregon. It’s one of several ways the Coquille Tribe contributes to the community. Click on the link to check out the new Facebook page.